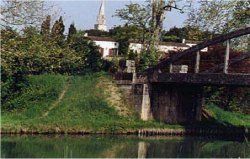 In the charming hamlet of Lompian, just one hour from Bordeaux, Maison du Canal offers guests the experience of living in a traditional French farmhouse close to some of the most beautiful villages and historic sites in Southwest France. Overlooking the Canal Lateral and near the 13th Century village of Damazan, this inviting and comfortable house is traditionally furnished and equipped with all modern conveniences. 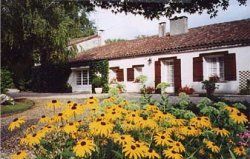 Maison du Canal is on 5 private acres of land. The road to the house goes along fields of sunflowers and corn, then crosses an old bridge over the Canal Lateral. The canal, which runs along the back of the house, has a shaded towpath that is wonderful for long or short walks and bicycling. Pleasure boats often pass by. 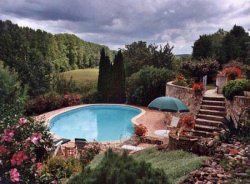 The pool is private and surrounded by flower beds and rose bushes. There are deck chairs and chaise lounges and a table and chairs for dining near the pool and barbeque area. 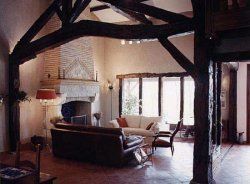 The spacious, two-story high living room has magnificent timbers and beams and a 17th Century fireplace. French doors lead to the terrace overlooking the canal. The dining room, adjacent to the living room, has an old farm table which seats eight comfortably. French doors lead to the front lawn with a swing set and a vegetable garden nearby. Stairs from the dining room lead to a mezzanine with a large convertible sofa, a desk and chairs for reading. All of this overlooks the living room. There's a "French blue and yellow" kitchen with breakfast table, microwave, wall oven, dishwasher, coffee maker and everything needed for cooking. French doors lead to the dining terrace outside. Just off the entryway there's a large study with tiled floors, desk, bookcase, telephone, Fax and computer hook-ups. At the far end of the study is a satellite television receiver with VCR and DVD players. A large picture window looks out on the garden. The Master Bedroom has a queen-size double bed and built-in armoire. Bedroom #2 has a queen-size double bed and large armoire. Bedroom #3 has a single bed and armoire. Bedroom #4, upstairs from the study, has a single bed and a view of the canal. There are two full bathrooms, one with bathtub, one with shower. There's a large Utility Room with new washer and dryer. NOTICE: NO CHILDREN UNDER 8 YEARS OLD.